On the chalky grassland and in the open shrubby woods on Eastern Mon a vegetation much like the alpine meadows (Jydelejet - right picture) can be found. 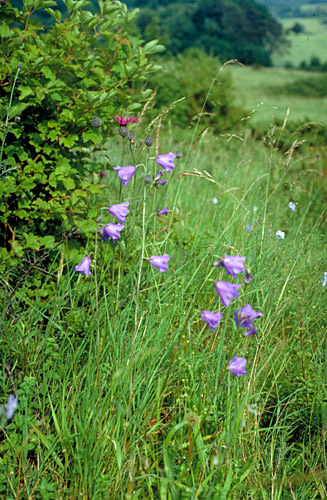 The flora is very rich especially on the grassland with several species of rare plants. The valley Jydelejet is a very old grassland that has been grazed for centuries. The buttom of the valley has been under farming and fertilized, but this stopped for about 50 years ago. The slopes of Jydelejet has recently been cleared for bushes and trees that threathened the light-loving vegetation. To day most of Jydelejet is under grazing to preserve the rare flora. It is forbidden to pick flowers all over Jydelejet and the protected parts of the cliffs of Mon. 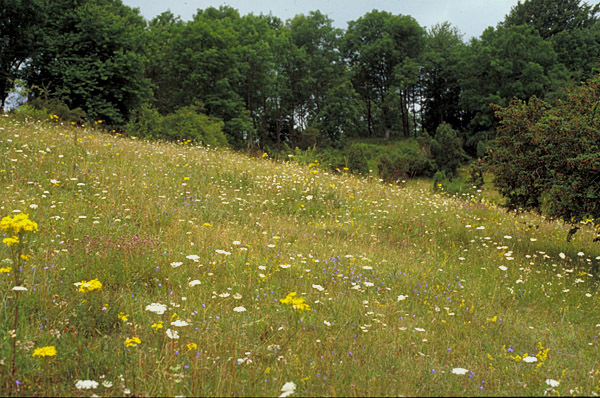 The calcerous grassland in Jydelejet has a very rich flora. 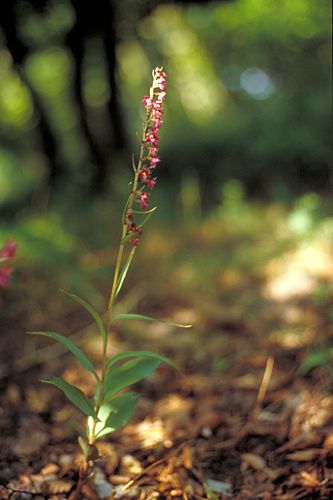 Characteristic species are Teesdalia nudicaulis, Orchis purpurea, Origanum vulgare, Ribes alpinum, Juniperus communis, Sanguisorba minor ssp. minor, Campanula persicifolia (picture below), Erysimum hieracifolium (in slides near the coast), Cirsium acaule, Scabiosa columbaria, Silene nutans and Listera ovata. The limestone hill Høvdblege south of The cliffs og Mon is also worth a visit. In early summer the south slope is coloured blue by flowering Linum austriacum and red by Onobrychis viciifolia. Both species have been introduced to the place and are now fully naturalized on Høvdblege. Along the path leading to Høvdblege the quite rare Vicia tenuifolia can be seen. 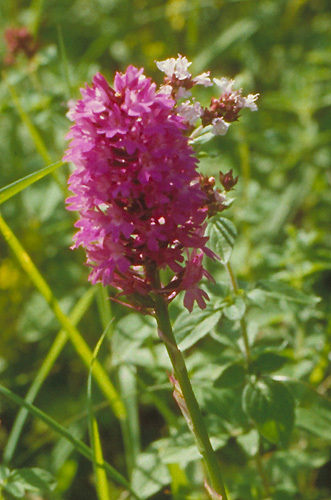 The orchid flora in Jydelejet and in the area around The cliffs of Mon is outstanding in Denmark and several species have here their only danish site. Pyramidal Orchid (Anacamptis pyramidalis) in the picture below was earlier known from a few places in Denmark, but to day it can only be found in a small area on Mon. 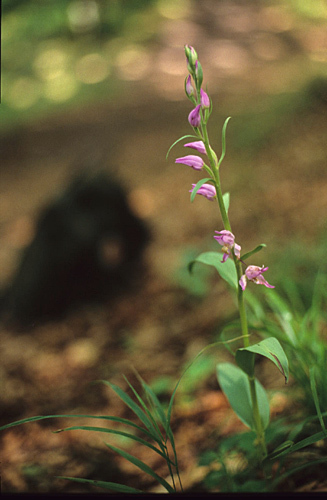 The Dark-red Helleborine (Epipactis atrorubens) in the left picture was until recently only known from Mon where it is quite frequent in shrubby vegetation. A few years ago it was surprisingly found in small nunbers on The Funen and in a forest on lime in Northern Jutland in larger numbers. In the woods on The cliffs of Mon are Cephalanthera rubra (picture below) in some places quite frequent. This species has only one other danish site in a forest in Himmerland in Jutland. Epipactis leptochila can also be found on Mon but have a few other sites on The Danish Isles. Other orchids from Mon are Cephalanthera damasonium in forests and Herminium monorchis in fens on slopes near the coast. Back to The limestone cliffs of Mon.